For other uses, see Diamond Dust (disambiguation). "Greatly enhances magic and summon power. Raises max MP by 3." "A special attack card with ice-based attacks. Powerful and the easiest to handle." 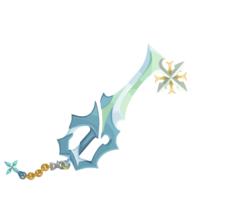 The Diamond Dust is a Keychain for Sora's and Player's Keyblades that appears in Kingdom Hearts Final Mix, Kingdom Hearts Chain of Memories, and Kingdom Hearts Union χ. In Kingdom Hearts Final Mix, Sora is rewarded with the Diamond Dust for clearing the Gold Match. The Diamond Dust's appearance varies depending on its upgrades, most of which are only seen in Kingdom Hearts Union χ. 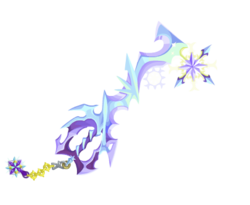 Across its various incarnations, this Keyblade appears to be made of ice, and both the teeth of the blade and the Keychain's token are snowflakes. The default Diamond Dust has a dull color scheme. Its handle is a light teal, with its guard being segmented and fractured. The blade is a straight shaft with a light blue color scheme, with a white and gold snowflake as the teeth. The Keychain's links are golden (save for the first, which is silver), and the token is a 4-sided snowflake. 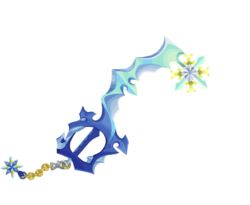 The first upgrade, also seen in Kingdom Hearts Final Mix, has more of a cobalt color scheme with the handle and guard. The guard is more complete, and the blade is brighter and curved. The teeth manifest as a teal and yellow snowflake, with the center being a diamond star. The Keychain's final link is blue, and its token resembles a simplified version of the teeth. The second upgrade bears a more ornate handle, bearing a sky-blue and azure color scheme. The guard has more spikes surrounding it, and the blade is longer, also with spikes from the inside emerging from the outside and a faint snowflake appearing at one end. The teeth manifest as an ornate, golden, and blue hollow snowflake, with the center being a diamond star. The Keychain's links are brighter, and the token is a simplified version of the teeth. 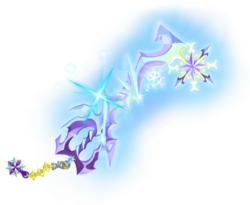 The third upgrade cloaks the Keyblade in an icy aura, with a lens flare from the blade. 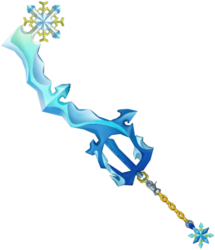 The Keyblade's name is based on the traditional attack of the Final Fantasy summon, Shiva. ↑ Only available after defeating Marluxia. This page was last edited on 24 April 2019, at 17:55.